Shop our selection of custom repair parts exclusive to our Chicago Faucet Shoppe! Exclusive Chicago Faucet Shoppe merch is here! Your support is SimplyFaucetnating®! 2" x 1-1/2" x 6" - Closet Offset - This 2" closet offset is tough to find. Our Chicago Faucets Clawfoot Tub Combo includes everything you need to make a Chicago Faucet for your clawfoot tub. Includes faucet body with mounting adapters at 3-3/8" centers, small gooseneck spout and supply/locking shanks..
Hansa Diverter - Diverter Assembly. Please Note: White cap adapter can be removed to expose brass treads to screw onto diverter rod. Chicago Faucet Shoppe - 2500-EXT - 1 inch total extension kit for the Chicago 2500 series thermostatic valve. 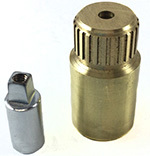 Chicago Faucet Shoppe - 4-65-24 - 4/65", 24 TPI (threads per inch), hose to 3/8" compression adapter.